Strange it is… Last weeks when I traveling from Haaksbergen back to Amsterdam, it is always snowing… this already for several weeks. I mean this week we had some very nice sunny days, especially for this time of year. Days that one almost could feel the spring in the air…. Again it shows that nature does what it wants and nothing we silly humans can do about it. Anyway, after Wierden the snow started to disappear again… to reappear in Amsterdam! (I know the picture above is not sharp. 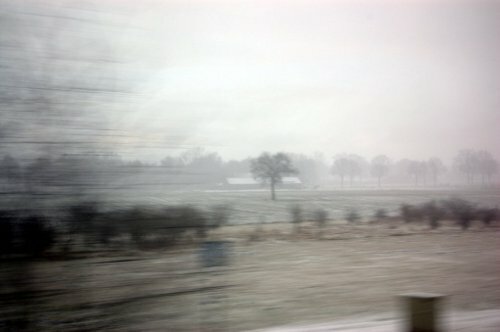 But somehow I like the effect caused by taking this picture through the window of a riding train).